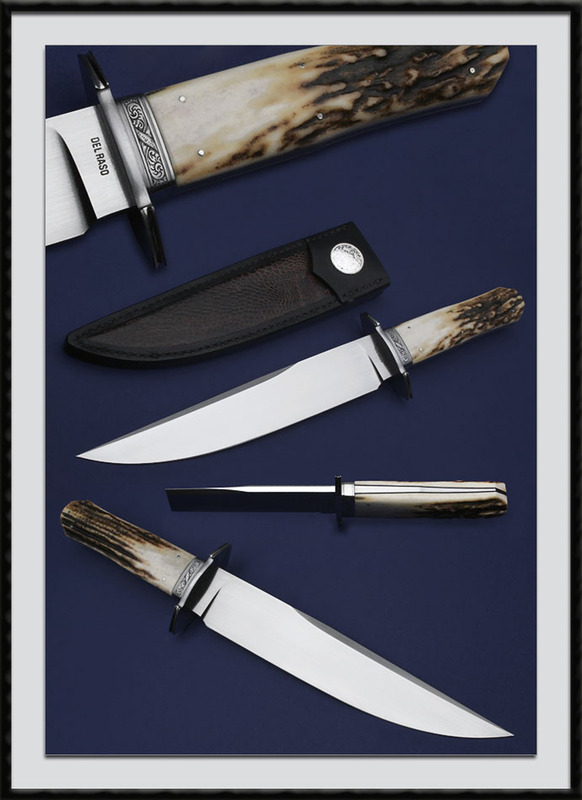 Australia, Peter Del Raso crafted this Presentation Sheffield style Bowie, Flat ground ATS-34 @59RC, BL = 9", OAL = 14", Hand rubbed Satin Finish blade with a Distal Taper, Full Tapered Tang, 416 SS Fittings, Carved & Fluted Guard, Engraved Ferrule by Fellow Aussie Phil Vinnecombe, 6 SS Pins and a Black liner accent Presentation Stag scales. Fit and Finish are of the Highest Order. Comes with the pictured Presentation sheath made of Buffalo leather which has an Emu Leg skin inlay. Condition New, direct from Peter's shop. Peter's craftsmanship is some of the finest work that is offered on the RCK website. It has been nearly 2 years since the last Bowie by this maker was offered.